Press Release (ePRNews.com) - COPENHAGEN, Denmark - Oct 04, 2017 - iMotions, the leading provider of solutions for multimodal biometric research, and Neuroelectrics, the leading manufacturer of medical EEG headsets with dry and wet electrodes for fast and scalable testing, are joining forces to expand EEG further into the digital age. “Neuroelectrics is really excited to partner with iMotions to offer an advanced platform for Biometric Research that will be able to offer our high quality dry and wet electrode EEG technology with 8, 20, or 32 electrodes to users worldwide,” says Ana Maiques, CEO, Neuroelectrics. As part of the agreement between the two companies, Neuroelectrics state of the art EEG hardware will be fully integrated into iMotions’ platform to allow for seamless data collection, synchronization, visualization and analysis in combination with other sensors and technologies such as eye tracking, galvanic skin response, facial expression analysis, and much more in one single computer system. “We’re seeing the adoption of EEG at a much larger scale, being used to investigate and predict human behavior at much larger scale than before. 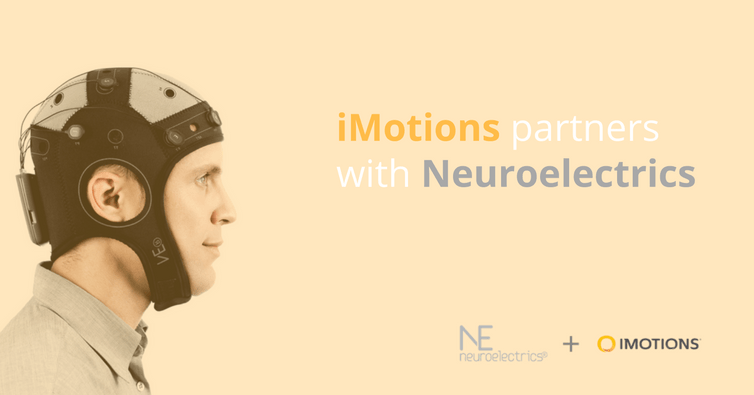 With our new partnership with Neuroelectrics we’re pleased to offer even more options such as dry electrodes for ours and Neuroelectrics’ clients to create more cutting-edge research,” says Peter Hartzbech, founder and CEO, iMotions. The full integration will already be available to all clients in the next version of iMotions, scheduled for October 2017.
iMotions provides software, hardware, and services to academics, neuromarketers, UX researchers, medical/health researchers, and Fortune 100 companies to elevate human behavior insights by using psychophysiological measurements from eye tracking, facial expression analysis, EEG, Galvanic Skin Response, ECG, EMG, integrated with self-report measurements from surveys. Founded in 2005, iMotions has offices in Copenhagen, Boston, Singapore, and Berlin. Its solutions are used by more than 600 clients in more than 70 countries around the world by leading academic institutions such as Harvard, Stanford, NYU and MIT, and leading brands such as P&G, Unilever, and GM. Neuroelectrics is one of the world’s fastest-growing EEG company and provider of a wide range of brain health solutions, including non-invasive brain stimulation, used by more than 400 clients worldwide. Founded in 2011, Neuroelectrics has offices in Boston and Barcelona and has received numerous awards such as WIRED’s 2015 Best Health Startup. The unique EEG technology can be used using both dry or wet electrodes and allows for telemedicine home monitoring & treatment to tackle challenging unmet medical needs. Neuroelectrics’ EEG devices are CE Medical Device approved in Europe and FDA cleared in the USA. The company services the research community as well as the clinical community working with some of the best Research Hospitals and Universities in the world such as Boston Children’s Hospital, John Hopkins, Yale, MIT, Harvard, UCSF, and VA Medical System.